With the 2014 Nike Easter Pack releases coming right up, we like to take a look at what the competitors are placing on shelves this week. FinishLine is stretching out the holiday spirit by releasing the Easter colored Nike Air Max FB Mercurial pack little by little. Reebok will release their own Easter themed kicks. 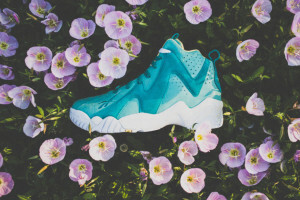 The Reebok Easter Pack comes in his and hers flavors. 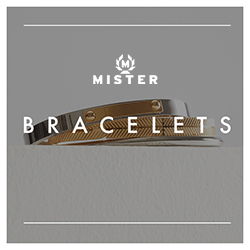 You can cop them April 18th at the links below. The Kamikaze II Easter has an almost pastel Teal and Electrolyte colorway and will be available in mens sizes for $100. 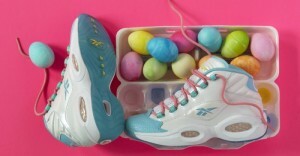 The Reebok Question Easter is white, accented with Hydro Blue and Light Pink and will be available in GS sizes for $95.